I quit my job, just before leaving for Kenya. I quit it, and after I returned I made the dive into full-on freelance worker-ness. If worker-ness is even a word. I'm starting nearly from scratch, and duh-ude, is it hard to start there. Slow. Completely uncertain. Faith building, yeah, but that doesn't change the fact that I don't want to look at my bank account balance right now. Or that every proposal rejection doesn't sting. That it's depressing to check my email to see that nothing has come in yet, but I do it anyway. I want to be busier. I'm used to having little free time in my schedule and many more things to do than I can fit in. My feet want to go, go, go. My hands want to do, do, do. My brain wants to keep planning, plotting, scheming. It's more than I can keep up with emotionally. I'm working towards that. More time in the Word. More time praying. More time with my family. Less screen time and new information at the speed of light. More taking things in. More writing things down. Less talking, more listening. All the things I can do when I slow down. Life goes by at an increasingly fast pace. 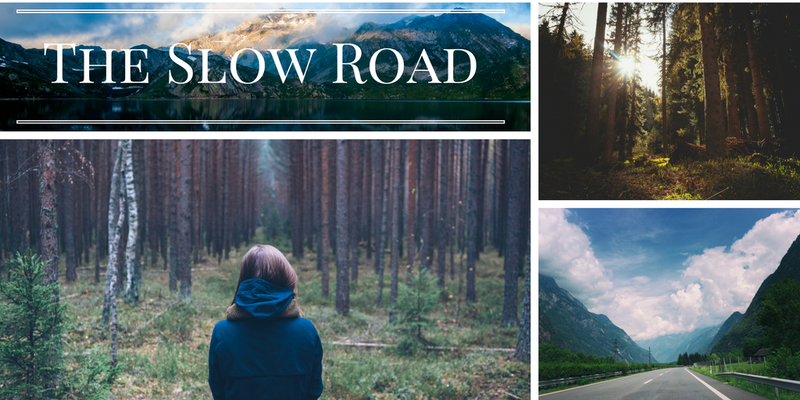 What I'm (re)learning right now is how to take the slow road. As frustrating and tiring and incomprehensible as it seems right now, I think it's going to be worth it.